Health access workers can help you connect to care by finding a doctor; applying for health coverage programs; connecting to community resources and agencies as well as prescription assistance programs. To connect our friends, family and neighbors to a comprehensive, integrated delivery network of health, human and social services resulting in improved access and removal of barriers to needed resources. Through RUAH, Health Access Workers are here to help you with all your needs. When you come into the hospital or doctor’s office for services, be sure to let the staff know you’re working with a Health Access Worker. That way, we can better serve you by working together as a team to help you remove any barrier to you and your family’s health. For more information go to Contact Us to find your RUAH location. Family and Social Services Administration (FSSA): Indiana's state wide agency that provides services and enrollment assistance for programs such as Hoosier Healthwise, Healthy Indiana Plan (HIP), Supplemental Nutrition Assistance Program (SNAP), etc. The United States Social Security Administration: Click to find out more about retirement benefits, Medicare, etc. Indiana's State Department of Health: Information about Immunizations; public health issues; etc. The Dispensary of Hope is a not-for-profit social venture that provides sustainable access to medicine for underinsured communities. Covering Kids & Families of Indiana, Inc. (CKF-IN) is a statewide organization committed to ensuring that all children and families eligible for Medicaid and the State's Children's Health Insurance Program (SCHIP) are enrolled. Covering Kids & Families of Indiana is a partnership of more than five hundred organizations and individuals "Advocating Health Coverage for All." Click for more information on Community Health Workers and state coalition health task force. The Center for Pathways Community Care Coordination (CPCCC) is a collaborative partnership between the Rockville Institute and the Community Health Access Project (CHAP). Its mission is to reduce disparities in health outcomes and health care among vulnerable at-risk populations. Connect2Help 211 helps callers, emailers and visitors to the website to obtain basic needs (food, shelter, heat, etc. ), legal assistance, or find help in fleeing domestic violence. Medical Interpreters are available in person and/or by phone at all points of services and access within the St. Vincent Health System. Any Associate will be able to point a non-English speaking patient to the resources that will aid their communication with providers and associates. St. Vincent Health / RUAH continues the work of improving patient centered care for all LEP patients and clients through translation of vital documents. Vital documents are translated for patients in languages other than English. 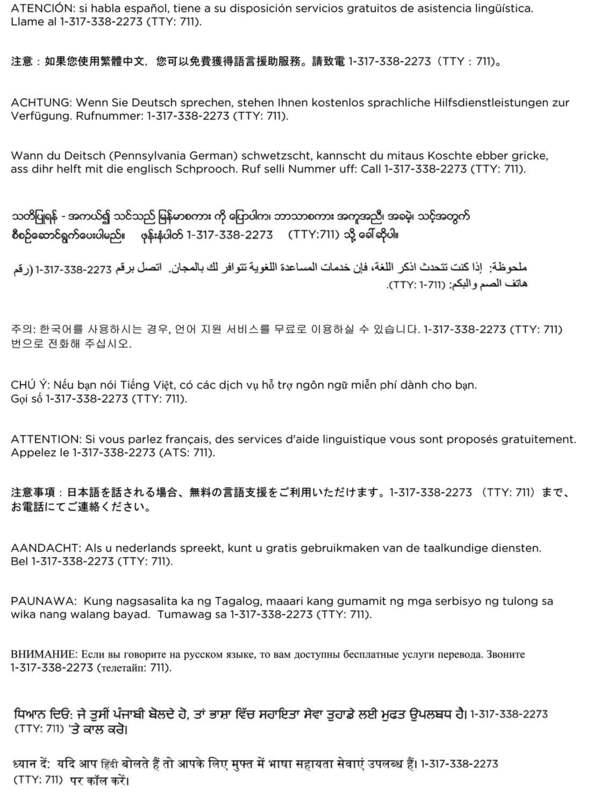 Through the document translations process St. Vincent Health / RUAH continues to provide effective communication that will promote, facilitate and advance the provision of culturally competent and patient- centered care for those who do not speak English as their primary language. Basic interpreter skills: Roles, ethics, conduit and clarifier interpreting, and managing the flow of the session. Information on health care: Introduction to the health care system, anatomy, and basic medical procedures. Culture in interpreting: Self-awareness, basic characteristics of specific cultures, traditional health care in specific communities, and culture brokering. Communication skills for advocacy: Listening skills, communication styles, how doctors think, and appropriate advocacy. Professional development: Effective communication, professional conduct, self-care, and resources for professional growth. Course activities include: role play activities, practicing interpreter skills in small group settings, hands-on interactive activities, a final exam at the end of the program. A score of 70% or higher on the final exam is required to pass the BTG course. The course and final exam are administered in English. Weekend and weekday courses are from 9 am to 5 pm each day. Attendance in all course days as scheduled is required in order to complete the training program. The course is limited to a maximum of 20 candidates per class. Courses are three days the first week and two days the second week. The "Certificate of Completion" will be mailed to all course participants after successful course completion. All BTG training Instructors are CCHCP/St. Vincent Medical Group licensed and trained. All training course communication is primarily by email, St. Vincent Medical Group cannot be responsible for non-receipt of important information due to you e-mail’s not working. If you have not heard from St. Vincent in a reasonable amount of time, please contact the RUAH office at 317-338-8670. Print and complete the two-page registration form which includes a course agreement that must be signed by the applicant Mail signed and completed registration forms with payment of a $500.00 to cover the language proficiency assessment and processing fee. Make check or money order payable to St. Vincent Medical Group. Students are highly encouraged to register here. If you cancel your enrollment for a BTG course, all fees up to $400.00 will be credited to the applicant for enrollment in another BTG course date 10 business days prior to the start of the course. Failure to notify RUAH office of cancellation at least 10 business days prior to the start of the course, will result in no refund. If you wish to receive a refund of all paid fees up to $400.00, you must submit a written request to RUAH for the refund. All written request for refunds should be sent directly to the RUAH office at 8424 Naab Road, Building 1, Suite 1A, Indianapolis, IN 46260. Please allow 15 business days for processing. What about financial assistance or job placement assistance? St. Vincent Medical Group / RUAH does not offer financial assistance or sponsorship assistance for tuition fees to community applicants. St. Vincent Medical Group / RUAH does not offer job placement or referral assistance. Participants interested in working for a specific hospital or clinic would need to contact Human Resources at the specific organization; including St. Vincent Health. Do you teach Medical Terminology, Spanish or other languages? The BTG course does not teach medical terminology, during the course you will receive one day of instruction around medical terminology and a basic review of anatomy and body systems from the course instructor and a Registered Nurse professional. Participants will receive a bilingual medical glossary and a BTG handbook as a reference tool. The BTG course is not a language course. It is expected that all BTG participants are proficient in two languages, one of which is English. We do not offer language instruction courses. Will I be a certified Medical Interpreter when I finish the program? There is NO State of Indiana certification for medical interpreters at this time. You will be given a certificate of completion that is accepted by area healthcare organizations. You will be given 45 days post course to retake the exam at the RUAH office, a final score of 70% or higher must be obtained to pass the make-up exam. The CCCLN originated with its champions – Drs. Mark and Sarah Redding – and grew to a network consisting of 17 hub directors, representing 16 distinct community hubs in 10 states. As the network evolved, members engaged in community-based participatory research activities and developed work products such as a guide that provides a step-by-step process to build and sustain an infrastructure to support the delivery of community care coordination services. In September 2011, the CCCLN transitioned from an AHRQ Health Care Innovations Exchange-sponsored learning network to the National Center on Community Care Coordination in the Rockville Institute for the Advancement of Social Science Research. The Agency for Healthcare Research and Quality's mission is to improve the quality, safety, efficiency, and effectiveness of health care for all Americans. As 1 of 12 agencies within the Department of Health and Human Services, AHRQ supports research that helps people make more informed decisions and improves the quality of health care services. AHRQ was formerly known as the Agency for Health Care Policy and Research: The Innovations Exchange helps you solve problems, improve health care quality, and reduce disparities. Find evidence-based innovations and QualityTools. View new innovations and tools published biweekly. Learn from experts through events and articles. Standardizing Community Care Coordination Measures Linked to Improvements in Quality of Life and Health Outcomes Among Vulnerable Populations: The purpose of this study is to assess the relevance, feasibility, validity and reliability of the measures through a pilot test at five sites located in California, Indiana, Nebraska, Ohio, and Texas. This work has facilitated the work of RUAH to move from a Volume (inputs/outputs counting) Model to an Outcomes Based Model. St. Vincent Health was the sole Indiana recipient of funding to increase enrollment focused on children who were "hardest to reach" in 7 Indiana counties (Madison, Gibson, Perry, Posey, Spencer, Vanderburgh and Warrick) from 2009 to 2011. More than 1.5 million children gained Medicaid or CHIP coverage during federal fiscal year 2011 (October 1, 2010 – September 30, 2011). In total, Medicaid and CHIP served more than 43.5 million children last year. Click here www.insurekidsnow.gov to find out more about insurance coverage options for Children. RUAH facilitates the Work Study program for Providence Cristo Rey High School. Providence Cristo Rey is a private, college-preparatory high school for students from families with limited financial means. Providence Cristo Rey combines rigorous classroom instruction with real-life corporate work study experiences for our students by partnering with the finest businesses and corporations in the Indianapolis area. The involvement of St. Vincent Medical Group in the Corporate Work Study program allows Providence Cristo Rey to make a faith-based, college preparatory education affordable to all students and families who could not otherwise afford a Catholic education.